LodgeCraft has compiled an elegant collection of rustic dressers and chests to bring customers like you the highest quality furniture on the market. Since 1988, we have forged strong relationships with some of the nation's leading furniture manufacturers to provide you with the best rustic dresser selection online. Choose from a variety of styles, including log, rustic and mission styles as well as a great selection of wood type and finish options. Cherry and oak mission, rustic hardwood and pine log dressers with clean-peel, skip-peel or full cambium options, and beautiful alder or pine dressers can be ordered directly from our LodgeCraft workshop. 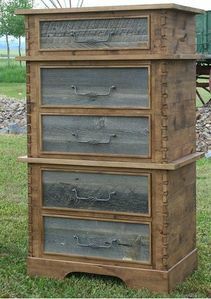 We also feature the ever-popular line of barnwood furniture, which includes a variety of rustic dressers and chests. No matter what room you are redecorating, we have the perfect rustic dresser to complement any bedroom furniture. Contact us to discuss your needs, and we will be more than happy to help you find the perfect rustic dresser and chest.